Explore the newest Wailua Homesteads real estate listings and homes for sale below. Escape life and buy your dream property above the hustle and bustle in Wailua Homesteads. Surrounded by green hills and valleys, Wailua Homesteads real estate is perfect for anyone looking for a private sanctuary or estate. Whether you want a home with a mountain backdrop or farm land, you'll find a welcoming retreat in Wailua Homesteads. And with only a short drive to bustling Lihue and Kapaa, Wailua Homesteads is the perfect place to call home. Many of the homes in this community boast unsurpassed views of the river and Wailua Forrest Reserve. Wailua Homesteads has a number of smaller subdivisions with a mix of starter homes, large estates and lots. Keep reading to learn more about Wailua Homesteads real estate or browse our listings below. Get Wailua Homesteads Real Estate Listings Before Your Competition! Wailua homes for sale are set back from the townsite and far enough away from Highway 56 to not be able to hear traffic noise. Located on the eastern side of Kauai just north of Lihue, these homes enable you to escape life as you know it and buy your dream property above the hustle and bustle of Wailua and neighboring towns. Surrounded by green hills and valleys, Wailua Homesteads real estate is perfect for anyone looking for a private sanctuary or estate. Whether you're interested in a home with a mountain backdrop or farmland, you'll find a welcoming retreat in Wailua Homesteads. With only a short drive to all the amenities and conveniences of the town, Wailua Homesteads is tucked away from it all offering you the perfect tranquil setting to call home. Wailua Homesteads real estate is tranquil and lavish. This community is a premier spot for farmers, gardeners and anyone looking for a little piece of paradise. With the nearby towns and activities, Wailua Homesteads has something for everyone. 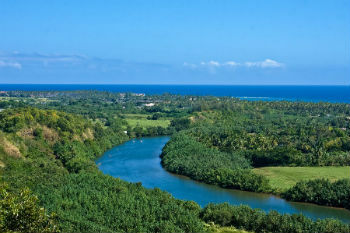 Many of the homes in this community boast unsurpassed views of the river and Wailua Forrest Reserve. There are a number of smaller subdivisions with a mix of starter homes, large estates and plots of land for you to choose from. For more affordable options in this area, focus your search along Kuamoo Road. Homes in this area are still gorgeous family properties with 3-4 bedrooms and 2-3 bathrooms, but they are much friendlier on the wallet. You can expect quiet streets with lush foliage set on just under 0.20 acres of land. Some of the homes may need a bit of updating, but this is ideal for you to add value to these sought after homes. With the mountains and lush trees surrounding homes in this community, you'll be sitting on your deck sipping your coffee wondering why you didn't purchase your family home here sooner. If you are the type of buyer that wants to build a home from scratch or build with a local developer, then Wailua Homesteads has some fabulous land for you to purchase. More affordable 1-2 acre lots are commonly found on the market, which is ideal for you to have a bit of land to surround your stunning one-of-a-kind property. If you are not sure how to get started with building in Wailua Homesteads, then be sure to contact Anne Eliason, who is more than happy to answer all your questions! This tropical community is nestled just north of the Wailua River, towards the mountains. The higher elevation of Wailua Homesteads means the temperature is generally a few degrees cooler than the nearby town of Kapaa. It also tends to rain in the evenings, keeping the streams, rivers, and waterfalls flowing. This makes Wailua Homesteads a gardener's dream! There's Kalama Gardens Plant Nursery in the community that will have all you need to start that tropical garden on your fantastic new property. Wailua Country Store at the intersection of Highway 581 and Highway 580, you'll find a good selection of food for you to choose from. If you head down Highway 580 into the townsite of Wailua, there's a number of shopping and dining options for you to appease the fussiest of eaters. For quick meals such as burgers, pizza, and bakery goods, you'll find lots to choose from at the corner of Haleilio Road and the Kuhio Highway. A little further north of that area just before Aleka Loop, there's a marketplace with a grocery store and artisan shops to keep you smiling! If you want to learn more about Wailua Homesteads real estate, please contact Anne Eliason, the Kauai real estate professional.